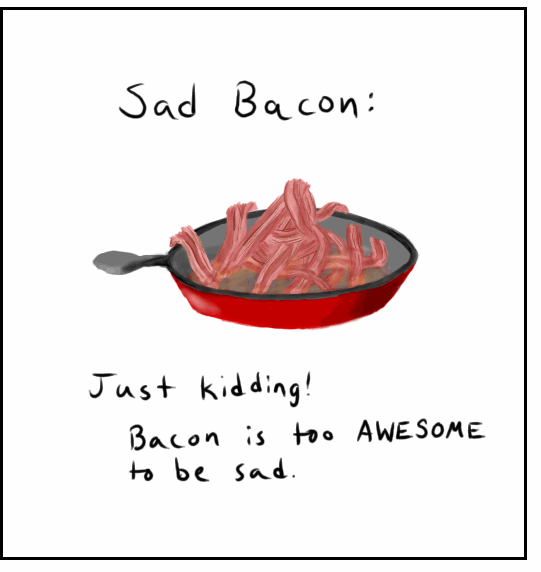 It saddens me greatly to to say I’ll be making an early departure from the Happy Land of 365DaysofBacon. Like bacon, circumstances and priorities sometimes twist, shrivel, pop, burn, flop, or disappear from your plate before you’ve had your bacon-y fill. No, I’m not forever giving up bacon. That’s just stupid. No, I didn’t gain 39 lbs of bacon fat. Tho I very realistically might have eaten that much, ha! No, I didn’t get cancer, high cholesterol, heart attack, stroke, etc. Take that, MyPlate, AHA, CDC, public health educators! No, I didn’t get sick of bacon. Not. Possible. No, I didn’t become a wildly rich and famous bacon blogger with book and movie offers. Sorry. No, I didn’t become a vege-matarian. Paleo 4eva! No, PETA didn’t boycott me or dump paint on my head. Still baffling. No, I just finish off the last strips of bacon in the world. So you might as well breathe. No, I did not get rich off monopolizing or black marketing all the bacon in the world. Still working on that. No, the pig has not become an endangered species. Yet. I am still #1 Bacon-ator in all of ‘Merica! NOOOOO! You can’t leave 365daysofbacon………. 5) provide you with the knowledge that I have an “I ❤ BACON" tshirt (custom made by the way….my friend got it made for my birthday)!!! aww thanks so much! im fighting the temptation to say i may pop in and out when I have bacon fun that’s too amazing to keep to myself…. Don’t leave us. Please come back now and then. now that is some SAD SAD NEWS………..
i know. it was a very hard decision! thanks so much for your readership.. bacon hugs! SAD! I do have a small parting gift for you if you’re going to be at work today! I will miss your posts and your rapier wit! Lots of luck. thanks so much! i’ll miss posting! What?!? Who am I going to share my new Chocolate Covered Bacon (no, it’s definitely NOT the same as all that other stuff) recipe with?? i know, it’s a sad day! but def not preventing you from shaaaaring. omg yumm! Ok, fine. Will you still be available to write guest posts? Also: I can’t “Like” this post; because I don’t like it!! I don’t like it one bit! ah no… altho i imagine your reasons must be good and so full love and support your way and it’s been such a great ride – well done for making it this far and i hope the book at least does happen some day cos people will buy it cos BACON!!! So…how long will the posts be on the internet? I have to go back and copy some! You will be missed. I enjoyed your recipes, photos, and humor. I understand that you must depart, but, please, let me know if you move on to some other blog so I can visit. This one was fun! I forbid you to quit. Hehe.. come over and see my blog..SeriousBacon to keep those bacon dreams alive! Enjoyed reading your blog over the last 6 months, so much bacon awesomeness, Good luck in whatever you may be doing! sounds like a superstellar site. you can bet I’ll be visiting! I will just have to eat more bacon to compensate for this new hole in my life. Off to the store I go to purchase all the bacon they have! Please don’t bail completely! Don’t worry about posting every day, but keep this open and post when the bug hits you. I really enjoy your posts! thanks 🙂 I always enjoy your comments and value your loyal readership. Parting is such sweet sorrow! If I have something superbacontastical to share, I will! Excellent, thank you so much! I have enjoyed your writing, I’m just sorry I didn’t find you earlier! You think you’re about ready to do a Guest Post yet? I’m sorry to hear this. Your page is incomplete as you didn’t share the bacon cheesecake:) The pieofthebeholder wishes you the best. oh hoo hoo! i actually was gifted some bacon soap by a lovely blog follower. so far I have just kept it around for the scent…but hot bath season in upon us so…I’ll test it out soon! Please do! We miss you so much! No more wakey wakey…eggs and bakey–at least a post about them. You can now move on to 365 days of pork belly. Happy Transitioning! Pigs are as smart and affectionate as dogs. I would never eat a dog, and I will never eata pig!